Measuring just two and a half metres wide and 32 metres long, the newest restaurant in the city of Córdoba is literally located in a passageway, tucked between two buildings. Originally formed in 1870, the gloomy alley has been re-shaped by Argentine architect Ernesto Bedmar – head of Singapore-based firm Bedmar & Shi Design – and local interior designer Lucía Roland, to feature a light-filled space, set over two floors and seating just 36 people. ‘The idea was to create a space full of natural light,’ says Bedmar, who also happens to be the owner and was inspired the Asian knack to create the most out of small spaces. 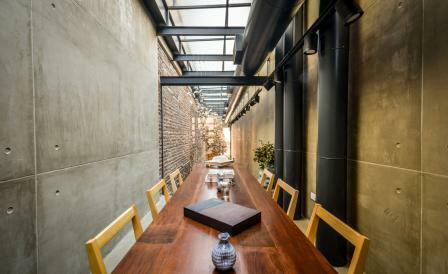 The original brick wall has been retained on one side, while exposed concrete conceals the other, highlighting the restaurant’s contrast between traditional and contemporary. Sleek, custom-made furniture fashioned from Guatambú timber is offset by a heavy-duty installation by artist Santiago Lena; weighing in at a monster 800kg, the piece –which hangs from the ceiling – depicts a flock of birds, made from 1,000 ceramic pieces. In the compact kitchen, chef Javier Rodriguez serves up a fresh, local menu from Patagonian king crab with capers, raisins and apple to veal sweetbreads with peppers and chimichurri- all cooked on the charcoal grill and in the wood fired ovens, of course.